Hui Hu, left, and Zifeng Yang are working with engineers from Goodrich Corp. to analyze the performance of the nozzles that spray fuel into jet engines. Credit: Bob Elbert photo/Iowa State University. A green laser flashed across the high-pressure spray that fuels a jet engine. Those flashes, some just 50 millionths of a second apart, froze the droplets for a camera to record and a computer to analyze. 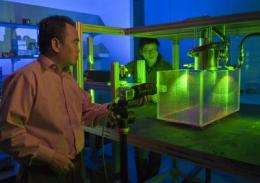 This is particle image velocimetry, just one of the advanced flow diagnostic tools used by Hui Hu, an Iowa State University associate professor of aerospace engineering, and his research team to study the performance of the nozzles that spray fuel into jet engines. It's a tool that Hu is now using to help the Goodrich Corp. Engine Components team of West Des Moines test and characterize the next generation of fuel nozzles. The joint project is supported by a $78,305 grant from the Grow Iowa Values Fund, a state economic development program designed to champion development of technologies with commercial potential and to support the growth of companies using those technologies. A manufacturer of fuel nozzles for commercial and military aircraft, Goodrich and its engineers are dedicated to the research and development of advanced combustion fuel nozzles designed to meet increasingly stringent requirements for reduced emissions on next-generation aircraft. This technology can significantly reduce oxide of nitrogen (NOx) emissions, improving local air quality around airports and reducing aviation's climate change footprint. Kevin Gordon, vice president of technology, quality assurance and business excellence for Goodrich's Engine Components business, said it's important for the company and its engineers to continually seek out industry-leading flow diagnostic techniques. A major goal in the industry is to find ways to sustain consistent engine performance while running very lean fuel mixtures. Burning leaner mixtures means cleaner, "greener" performance. "We want to understand the next technologies that will keep us in front of our industry - designing fuel injectors for gas turbine engines," Gordon said. "We're looking at these diagnostic studies and then taking that information to impact our designs and improve gas turbine engines." And molecular tagging velocimetry and thermometry, which uses lasers to illuminate and tag groups of molecules and a camera to capture images that reveal the velocity, temperature and density of those molecules. The tools help Hu and the researchers in his Howe Hall laboratory tell Goodrich engineers exactly what they need to know about fuel sprays, including the uniformity, direction, temperature and density of fuel droplets, how the droplets mix with air and how the droplets behave as temperatures change. "Engine efficiency and emissions are closely related to the quality of the fuel spray," Hu said. "How uniform is the spray before it is burned?" Hu has also developed and taught short courses about the testing techniques for some Goodrich research and development engineers. "We're working together to develop new technologies and teach engineers to use these advanced flow measurement techniques," Hu said. This deeper university/industry collaboration is designed to drive fundamental understanding and help define the next-generation fuel delivery products. And, this research will help determine what diagnostic techniques will be required in the future. Working with Hu to develop and use these advanced flow diagnostic technologies are Zifeng Yang, a post-doctoral research associate, and Daniel Dvorak, a graduate student in aerospace engineering.